A bear cam at Brooks Falls in Katmai National Park in Alaska caught a poignant moment when a mother bear came to the rescue of its three cubs, or came to their side for a scolding is probably more like it. A brown bear known as Grazer was standing atop Brooks Falls looking downstream waiting for a salmon to jump into its range. 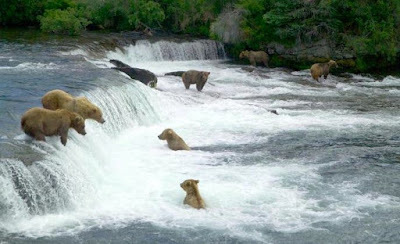 Bears typically catch the jumping salmon in their teeth. A third cub also went over the falls, but all of them were OK.
At the first glace I was worried coz lost family member always hurt me. Especially when an cool wild lost her cub and can't do anything, so sorry for them.